Marketing for profit Mega Power University Report. The auto repair shop program helping mechanic owned repair shops profit off knowledge they know, but can't use until now. 3 tweaks, 2 Rules that can double your income in 90 days. 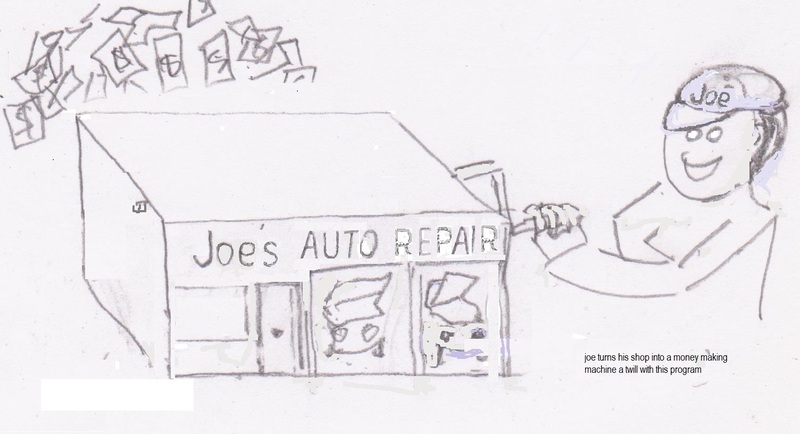 What is a great auto repair shop owner marketing goal to promote? The Mega Power Tune Repair Method which in ads we feature for you, explains why the car owners problem may be do to six dirty areas of the motor transmission or radiator that need cleaning, and adds anti-wear conditioning features to reduce friction, then fills worn areas, along with replacement of bad parts. Make Mega Power part of the corrective treatment to remove residues, friction, and their power decreasing negatives. Those that rob engines and transmissions of their like-new performance. Include Mega Power as part of estimate repair problem-solving procedure. Estimates would show Mega Power as a product part listed at $150. As an install cleaning labor at $150. Our guarantee of the fix! I'll help you with this if not understood. That's the estimate and billing procedure pricing to boost your income by performing our repair method. Mega Power is not an add-on product - No! It's part of what you use - as part of your car care and repair expertise to restore full combustion, proper valve closing speed, carbon removing, and friction reduction as part of the tune and repair fix process. This includes 36 items needed, 6 for each engine service, easy to follow directions, phone help, and marketing help provided. Shipped by FedEx to your door. Just $60 price for each car. $360 total with a once a month repeat automatic re ordering service. Save $210. Potential profit $1490! Mega Power Cleaners frees and cleans sticky bogged down moving parts to match the performance of the new parts installed. Mega Power Conditioners go where oil cannot and safely cleans troubled-spots in the engine, and where cleaning was not possible before for perfect restores breathing and combustion. Metal conditioners including MC+ smooth friction roughen, trouble-making moving parts. Smoothing stops the rapid wear factor and ends horsepower absorbing negatives. Restores lost horsepower giving tire-burning performance that impresses customers. Mega Power is included as part of what's being fixed, customers you provided a real value they can feel and enjoy as they drive. Customers come back for more - and why not - since you are the one to provide this type car care customers enjoy each day. It - provides years longer life before tear-down and clean up overhaul is needed. That's good! That's the beauty of your Mega Power usage expertise. To get started with Mega Power Auto Repair Shop Owner Marketing Program you need to know pricing and inventory stats, install procedures, pricing, and reorder fulfillment. To get all that and see other marketing help given to you to attract better paying customers by use of car owners seeking Mega Power advantages from you, call me... george at 512 665 3388. Mega Power's tune repair treatment is your auto repair shop owner marketing system amazing customers and boosting your income- they will come back to you for. Why this auto repair shop owner marketing is superior! New products are going from the old idea that solvent based engine cleaners - sold as an engine flush product, are what your motor needs - they are harmful, not helpful! Acids are your engine, and transmission's biggest problem causer. Acids come from combustion escaping past your motors sticky piston rings and mixes with and sludge's your oil. Sludge then travels and settles in the 3 worst places - causing more problems - like combustion blowby, oil burning, leaky seals, and noisy valve tapping. Advantages of new chemical cleaners are featured in Mega Power's Engine Treatment. These neutralize acids as they free and clean your motor's sticky piston rings. This ends blowby, limiting acid loads going down into your nice motor oil. Mega Power liquefies acidic residues and removes them allowing oil to again feed valve lifters and stopping the engine tap, oil burning, and power decline. Will it do those things every time? No! Those that are not we refund their money, or credit it for an actual overhaul - they probably need. The same Mega Power feature helps revitalize your motor's leaky seals and gaskets - stopping their seepage - all which popular engine flushes sold in part stores and quick lubes cannot help your motor with. 5- Mega Power includes MC+, with co-polymers. These fill worn spaces and quiets older motors and provide slippery movement to make rolling down the road easier - you can feel it protecting as you drive! As you can see, Mega Power offers real Hi-tech value to the retailer of Mega Power and to his customers. And of course, a good profit margin.